I'll start with the good! We had a yard sale at work the other day and my friend who does alterations was selling off a bunch of buttons. I scored big time! Shank buttons are getting really hard to find and they're pricey, I got all these and equally as many that I'm not showing you for the equivalant of $8. We worked a trade. Holy MOLY! I got such a deal. And there are great colors in here- lime green, orange, bright blue, red, yellow, white and black. That was all I bought- buttons. And I got rid of a ton of stuff, even Jim's Mom's old china. Yay. I have a lot of room in my attic again. Nosey Parker- up a cherry tree. Could she have picked a flimsier tree? I took this photo on Thursday or Friday, but she fell out of this tree on Saturday, from about 10 feet up. Lucky for her, her Daddy was outside and caught her, she was about halfway to the ground and her back was in down position. Sheesh. 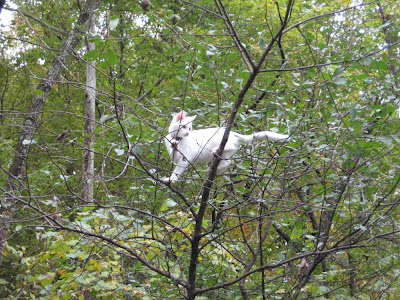 She went out on a twig and it snapped and she was hanging by one paw and fell. I hope it scared her and that she learned something. I'm really glad that I wasn't here to witness this. And it's probably my own fault that she couldn't hang on- we trimmed her nails the day before because she was hurting me when she made bread on my neck during the night. And the UGLY- my 18 month old iron went toes up this morning. It came on for a bit, but I noticed the light went out a few minutes later and nothing I did would revive it. So I thought I have nothing to lose and I took it apart. (Jim is out hunting or he'd have done it for me.) 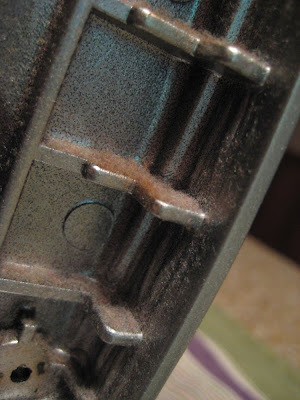 Not only do I not see a problem, I do see a lot of lint inside it, now- how the heck does that get in there, aren't these things supposed to be sealed? I found the little plastic water tank to be quite interesting. lol I liked this iron- non-stick plate, one hour auto-off, blue light went on, retractable cord. It's a GE for WalMart, I think. I'll try to get another one, because I hate spending big bucks on an iron and this one has the features I like. Maybe the next one will last longer. Look at all the LINT! 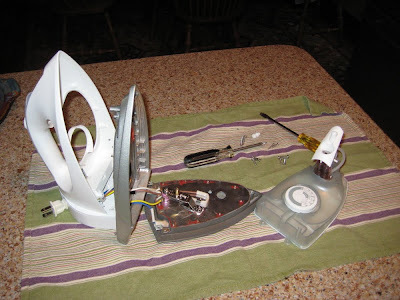 Jim will look at it and put the meter to it to see if he can fix it, but it's not an expensive iron so I imagine I'll get a new one tomorrow when we take Nosey Parker to the vet to be spayed. So there you have it- the good, bad and ugly. I don't think trimming her nails caused the problem. I think she was just being a typical cat. She'll get through her surgery fine but she'll need to be extra warm and quiet for a while afterwards. Be sure to keep your neck nearby in case she needs it! Now I'm wondering how much lint is built up inside my iron. At one point I watched a whole lotta sewing and quilting videos and stuff. All of them used the most amazingly expensive irons - $150 for an iron? you gotta be kidding me! Hope Nosey is doing well. I saw the picture of the buttons and I got all excited, I love buttons!! Great find, and you did GOOD!! 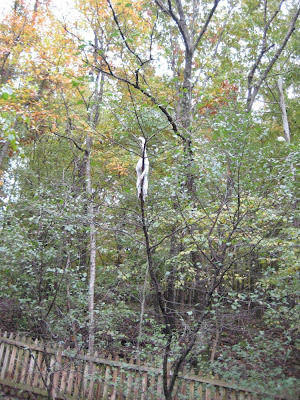 I looked in the tree of the first picture and mumbled, "Do wonder NP went climbing, look at the "white rag" in the tree." Then I zoomed in on the picture and shouted, "Holy crap!! That's Nosey Parker climbing around!!" I would have had a heart attack if I had seen her up there. I'm so glad that your hubby was under her to catch her - phew! After her surgery you'll have her all to yourself for a day or so. No trees, just TLC from her Mommy. Hugs to NP from me too. I saw where you took an old pincushion apart...now you've deconstructed an iron. Do you take apart everything before just dumping it?! You crack me up!